Home Dicots Dr M says: let it mow, let it mow, let it mow! Dr M says: let it mow, let it mow, let it mow! So, have you mown the lawn for the last time before Christmas? Well, if, like Dr M your answer is no, then, like Dr M, no doubt you can be found gazing guiltily out of the window at a scruffy, soggy mat of grasses, covered in equally soggy, manky leaves and praying for snow to hide it all away! So, how about a lawn which doesn’t need mowing? Or at least doesn’t need mowing very often? And how about a lawn which is not just monotonous grass, but a lawn beautiful with flowers and with fragrance and with pollinating insects? More like the lovely summery view in the featured image? Impossible I hear you say! And, until recently, you were probably right. 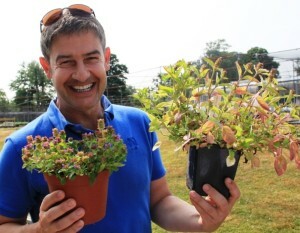 But enter one Lionel Smith to teach us an eXtreme botanical and horticultural lesson! Lionel Smith, PhD researcher at the School of Biological Sciences, University of Reading, has spent the last 3 years researching, developing and now creating the grass-free flower lawn! Lionel’s Lawns have already been exhibited at Chelsea 2013 where his Silver Medal-winning exhibit was entitled ‘A New Millawnium: grass free and full of flowers?‘. And Lionel Smith has overseen the development of (allegedly) the ‘Worlds first grass-free lawn‘ at the London Borough of Kensington and Chelsea! 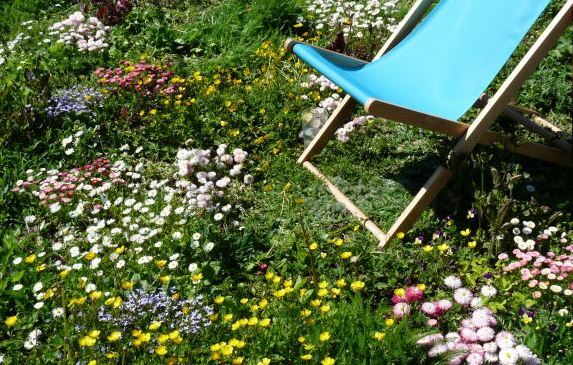 More on Lionel’s lawns: Check Lionel’s blog Grass-free and full of flowers and his website grass-free lawns and the myriad links therein for more details, and please contact Lionel to tell him what you think!